Commenting on blogs is the most easiest and safest way to get quality dofollow backlinks. Now a days, getting dofollow and nofollow backlinks are very difficult. But in this post I'll share one trick with which you will be able to find the list of blogs, which provides you backlink when you comment on it. 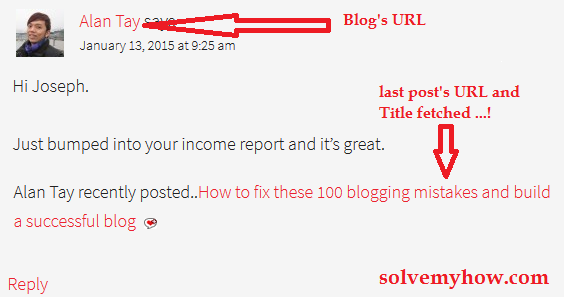 So, in this post you will see how to get backlinks by commenting. If you are a internet geek, you might be familiar with the word Backlink and the importance of it. But for those who don't know about backlink. It is the incoming hyperlink/URL of your website/blog from other website/blog. In simple words, the more number of backlinks you have pointing back to your site, the more popular your site will be. I think its pretty clear now what backlink is and how it will help you to get organic traffic from Google search. 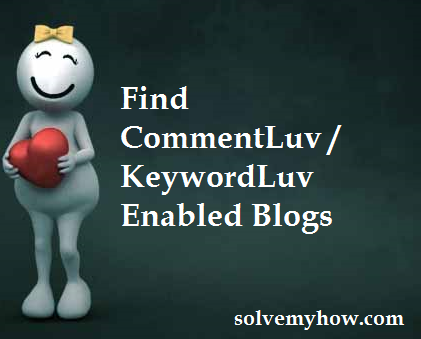 Here to find commentluv and keywordluv enabled blogs we will use one tool/website i.e DropMyLink. Lets see how to use them. Step 1 :- Go to DropMyLink. Step 2 :- Now here you will find 2 options. Keyword and Find. In "keyword" just enter the proper niche keyword and in "Find" select the commenluv. Step 3 :- Click on Search. Now, you will be redirected to Google search. All the search results are of commentluv enabled blogs. Visit any of the blog and leave you valuable comment there. So, in this way you will get automatic dofollow backlinks. (For technical persons) :- Do you know how Google has given these results ? Learn How to do Power Searching With Google. Step 4 :- If you want to find keywordluv enable blog. 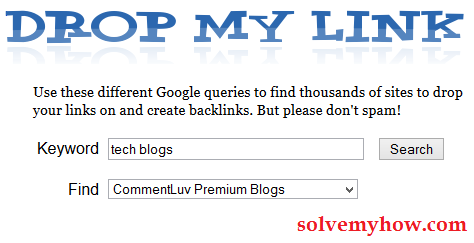 Then go back to DropMyLink, type Keyword and in Find select "Keywordluv Blogs". Step 5 :- Click on search. Now the search results will be of keywordluv enabled blogs. Go ahead, visit any blog and leave your valuable comments there and start getting backlinks from high pr sites. Note :- Some keywordluv enabled sites may be nofollow means you won't get backlink from there. But nofollow links are also important if it is coming from high page rank sites/blogs. In "Find" there are not only 2 option i.e commentluv or keywordluv. But there are many other option too like Do Follow Comments Blogs, etc. You can visit DropMyLink and check. Do you want to learn more link building techniques. Then check below 2 post ! So, this was all about how to find commentluv and keywordluv enabled blogs for getting quality backlinks by just commenting. Hope you found this article worth reading. If you have any queries regarding this post, please write it into the comments. Don't forget to share it with your social media friends and You can also Subscribe for SolveMyHow Newsletter to get Blogging and SEO tips right into your INBOX ! Blog commenting is good way to engage with others and gain some good traffic.If you comment on commentluv and keywordluv blogs its something like single stone two mangoes. and this is the easiest way to get quality backlinks for high PR ranks. Thank you for your kind words. Don't forget to share this post with your social media friends ! Very useful information. However the problem in some places is a lot of spam, just to take more backlinks. And moderating it takes a lot of time. Thank you for stopping by and appreciating my post and work. Well the bloggers who have enabled commentluv and keywordluv is for encouraging many comments. So, if one has enabled commentluv, will definitely going to give backlinks.